NASA Administrator Charles Bolden made the pledge to the House Committee on Appropriations today (March 20) during a hearing to answer lawmakers' questions about potential security lapses at space agency centers. "It is critically important for us to have confidence in NASA's ability to protect sensitive assets from exploitation," said U.S. Rep. Frank Wolf (R-Va.), who originally announced the arrest of the former NASA contractor during a press conference on Monday (March 18). At the center of the controversy is Bo Jiang, a Chinese national who worked as a contractor for the National Institute of Aerospace at NASA's Langley Research Center in Hampton, Va. He was arrested by FBI agents on March 16 onboard a plane bound for China departing from Dulles International Airport outside Washington. Officials say Jiang lied to law enforcement authorities about the electronics equipment he was carrying, and Wolf has accused him of being a spy for China. "We know that China is an active, aggressive espionage threat," Wolf said today. "The technologies that NASA works on are those that the Chinese most heavily target." Bolden assured the lawmakers that he took their concerns seriously, and said he's taken several steps already to find security failures within the space agency. 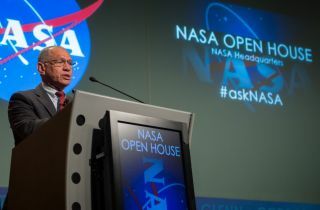 "NASA takes all your allegations of security violations, and those from anyone else, very seriously," Bolden said. "This is about national security, not about NASA security, and I take that personally. I'm responsible and I will hold myself accountable once our reviews are completed." In addition to initiating an internal security review, Bolden said he's also contemplating asking an independent panel to undertake an investigation. In addition, he ordered a moratorium on granting any new access to NASA facilities to people from countries considered to be espionage threats, including China, Burma, Eritrea, Iran, North Korea, Saudi Arabia and Uzbekistan. Existing NASA workers from those countries have also had their ability to access NASA facilities via remote computers temporarily suspended. The issue is particularly sensitive because NASA has been forbidden by Congress from cooperating with China in space. Wolf himself was the author of a clause included in a U.S. spending bill passed in April 2011 that banned NASA from working with China or Chinese-owned companies on any bilateral projects. "I don’t deal with China by direction of this Congress," Bolden said during a separate House hearing with the Science, Space and Technology Committee held yesterday (March 19). He called the prohibition "the elephant in the room" and said, "We're the only agency of the federal government that does not have bilateral relations with China." The rule has caused some tension, and Wolf suggested today that security lapses related to the Bo Jiang case may have occurred because NASA employees were trying to use contractors to get around the legal restrictions on working with China. "I respectful disagree with the implications of what you just said," Bolden countered. "As a matter of fact, we really feel that we have been fully complying with the law … As any organization of our size, we may have some gaps in compliance with those processes, but we were not attempting to work around the law."